Last week end (october 10 to 12, 2014), Alain Fauquier and I went, with our wives, to Belgium, invited by the Mario Lanza Society of Belgium, in the neighbourhoods of Brussels, a little town called Bornem. After one night in Brussels, we went to that little place where our belgian friends had made arrangements for the afternoon and dinner. The theme was Opera and Musicals, the world of singing, with exerpts of all great moments in music and entertainment. The show was a great job done by Leo, who worked on it at least the whole month of July! We were thrilled by those artists of a golden era, entertainment as an art and art as an entertainment, « Ars Gratia Artis » (remember the MGM motto, Art For Art?). « Crossover music » certainly does not exist, music is music, but artists who can litteraly bloom in either field, opera and musicals, jazz, or so called « easy listening », are not many, even in America. Versatility in singing (in french, we say « eclectisme ») is rare and when an opera singer tries « popular » songs or melodies, you can usually feel the weight of classical training and singing, which, at some moments, seems « out of tune » : something is lacking, in spite of the beauty of the voices (see West Side Story, by no less than the beautiful Kiri Te Kanawa and the handsome Jose Carreras : they had the physical beauty and presence and the voice, but we were far from West Side Story and the unknown and splendid, and unique singers of the movie ! The charm and the magic of the film were gone. Rare artists like Mario Lanza could sing practically everything, from opera to jazz, italian melodies, american musicals, religious hymns, thanks to his innate and inner musicality, that little something which cannot really be taught in any school of musicassidy, as was said by critic Claudia Cassidy about Mario Lanza. To be able to do that implies a lot of humility and respect for music, any music, without prejudice or snobism, it is like discovering countries and trying hard to understand their customs and traditions and language. It’s a gift, the gift of empathy. Such gatherings like the Lanza meetings are opportunities to reflect and think what is behind us, what makes us do this or that. I have the same feeling when I go to Philadelphia to attend the Mario Lanza Annual Ball and Singing Competition, which I have done several years in a row and until 2012. People coming from several countries and several states of the US, like a family meeting for Thanksgiving or Christmas! Why do I come just for three days in Belgium, leaving everything in Paris? And what about the others? Why do they come? Bob Dolfi used to say : « Mario Lanza brings good people together ». I don’t know if we were good, but we all had our good reasons to be there together, and the reasons had to do with the spirit and mind of a young man gone by decades ago, after « a brief shining moment », a young man whose voice and music conveyed some unique inner beauty of heart, with a sense of gentleness, happiness, mortality and suffering. In physics, when a phenomenon is unique and unexplainable, I think they call it a « singularity ». Oh! I forgot to say that we went to that music store in Brussels with all that jazz and classical music and guess what ? They had a lot of vinyl 33 rpm discs by Mario Lanza, collector’s items. We bought out the house! And also, thank you for your encouragements and mails! We do apprceciate and try to do our best. 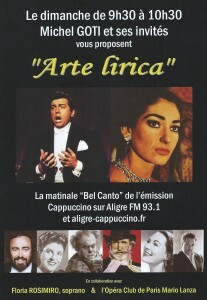 We also have a radio broadcast some Sunday mornings on opera. We did Mario Lanza, Tito Gobbi, Jussi Bjoerling, Renata Tebaldi, Maria Callas, Licia Albanese, Salvatore Licitra, Franco Corelli, and we are preparing a broadcast on Carlo Bergonzi, who has just passed away a few weeks ago. We also plan Alfredo Krauss. 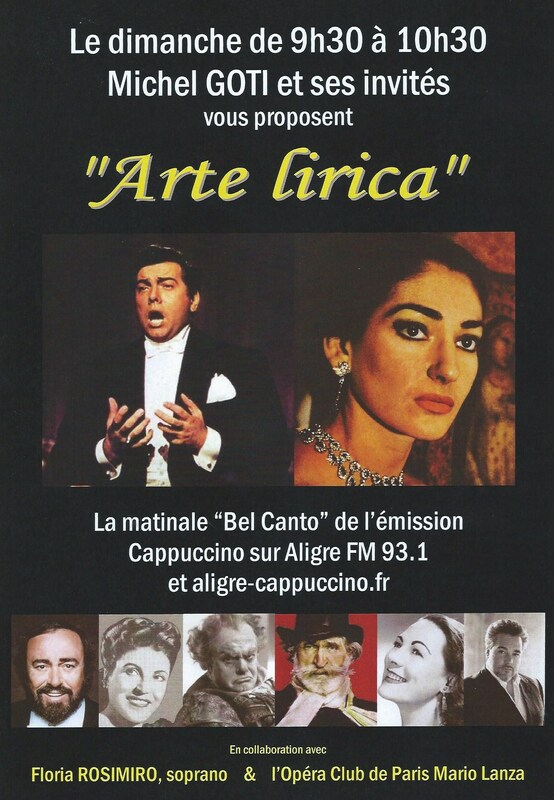 You can podcast those titles on the web site of « Radio Aligre », the italian radio of Paris, the show is « Arte lirica» (there is a link with aligre-cappuccino.fr on our web site Opera Club de Paris Mario Lanza). Of course, it’s in french, but there’s music!